World Press Photo 2016 is a global exhibition showcasing the best visual journalism of the past year. Compelling photos are displayed in the State Library of New South Wales until the 19th of June. I urge you to visit the impressive library and the exhibition. But a fair warning, some photos are graphic so viewer discretion is advised. The atmosphere at the exhibition was silent and reflective. The photos felt emotional and raw, bringing to life the phrase “a picture is worth a 1000 words”. The photos brought to life some of the remotest parts of the world, such as the Larung Gar Buddhist Academy in the Garze Tibetan Autonomous Prefecture. Tibetan Buddhists would travel to this place for the week-long Bliss Dharma Assembly. Photos of the earthquake that hit Nepal were also featured. These were some of the most emotional photos I had ever seen, apart from photos of the refugee crisis. Beautiful shots of nature, as well as some of the bloody truths of the world, are on display. They remind us to acknowledge that even though some of these issues don’t affect us directly, it will surely affect us in the long-run both personally and as a species. News of devastating events such as the earthquake in Nepal, the refugee crisis, or police brutality becomes much more real because you can’t simply change the channel and pretend things like that aren’t happening. But, not all photos that were displayed were of devastation. There were shots of sports such as basketball, ski-jump, and synchronized swimming. Photos of cultural traditions such as the feast of Las Mayas were included as well. Life at the Antarctic was also captured, truly reminding us that there is life just about anywhere. It is important to remember that though these shots are beautiful, they are more than art. They are real people, real photographers, who sometimes risk their lives to showcase the truth. These are real issues and each shot tells a story. This exhibition connects us with each other because empathy is universal. So please, visit the exhibition and see for yourself these compelling images because the photos featured in this article do not do them any justice. The library opens at 9am Monday – Friday and 10am Saturday – Sunday. 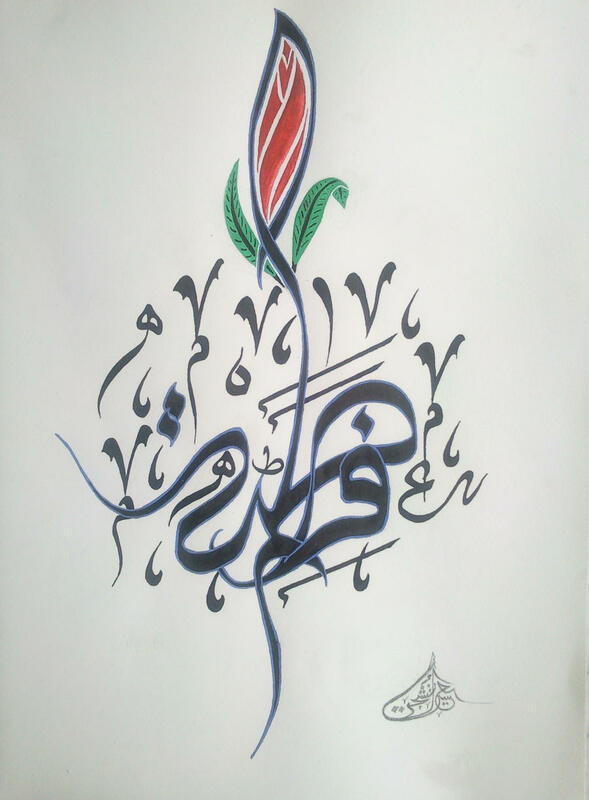 Sometimes calligraphy is used as a substitute for “regular” art. 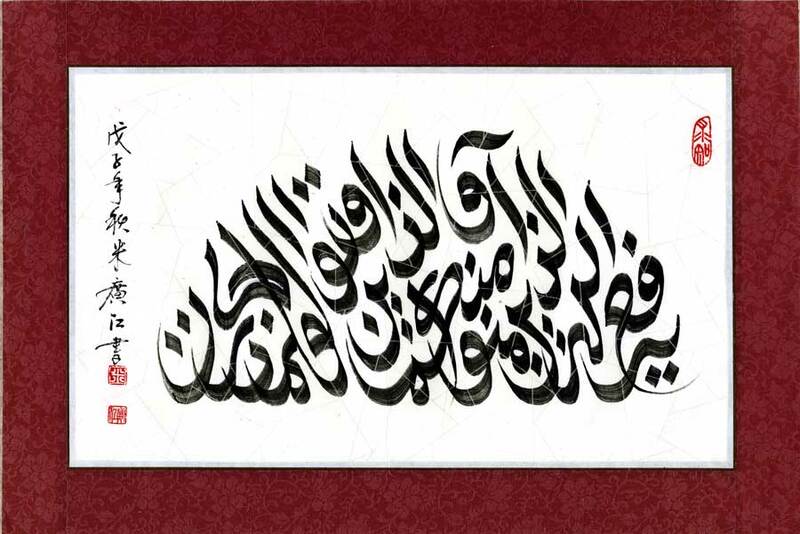 In Islam, it is forbidden to paint portraits, hence, why Arabic calligraphy boosted in importance and sophistication. Islamic calligraphy has been used from architecture to coin design, with beautiful writings of passages from the Qur’an, the holy book of Islam. 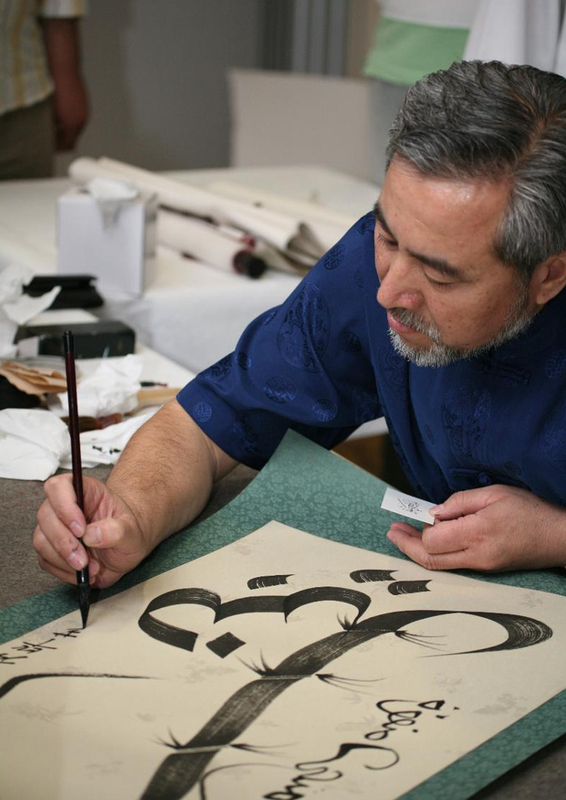 In Chinese history, calligraphy is seen as one of the highest forms of Chinese art. What you wrote is as important as the way you write it. The history of Chinese calligraphy is as long as that of China. It’s more than just a showcase of the abstract beauty of lines, but a way of self-expression and preservation of culture. His work has been displayed in galleries and museums around the world, often known as the first Chinese/Arabic artist. Visit him on his website for more details. As an added bonus, here are some modern calligraphy art to soothe your senses. Be right back, I am going to find myself a brush, pen, and some ink. 1/A: Doctor, how can I live longer than 100 years? 3/What’s the best place to hide a body? 8/Don’t break anybody’s ear, they only have one. 9/”One day our country will be corruption free”. Which tense we should use in English? 10/Waiter: Would you like your coffee black? Having low moments and experiencing negative feelings is not uncommon. But it’s the expression of those thoughts that will always help. This is what the University of Notre Dame aims to do this week. Every year most universities dedicate a week to bring together their students. What unites us is our passion, inspirations and hard work. So come down if you’re free and join the University of Notre Dame students in raising awareness of mental health concerns. See you there and have a great week! It’s pretty common for teens to wish they were on their own, living the independent life, with no parental units breathing down their necks. We’ve all been through that. I’ve always wanted to be independent — I’ve always dreamt of going to university, living on my own, setting my own curfew, exploring and absorbing culture through my pores. I just never thought that time would come so soon. I’d always prepared myself for the separation from my parents after I graduated. It was the norm. I’d come to terms that graduation marked the beginning of my adult life. But, alas, that is not always true. It was the summer after my junior year. Australia wasn’t a curve ball my parents threw out of nowhere; it’s been in the works since the beginning of the school year. I was excited. And nervous. Really, really nervous. I was no stranger to uprooting to a strange land; I’ve had to move to Saudi Arabia at 9. Settling into Saudi Arabia, however, is far easier than Australia. You’d think, “Well, you’ve lived in a conservative society all your life, wouldn’t you want to be independent?” I did. But there was a catch. I had to do it without my parents. They flew Down Under with me, of course, but they were only around for 1 week. I was only 17. How was I supposed to survive three months and three weeks without my parents?! They don’t teach you this kind of stuff in school. But thankfully, my mamma didn’t raise no fool. I could take care of my basic necessities just fine – I knew how to wash my clothes, change my sheets, wash the dishes, clean my room, the simpler stuff. I just couldn’t handle finances well. But it wasn’t something I couldn’t learn. Because I am underage, I had to stay in a home-stay. Living in a home-stay helped ease the homesickness – my host will usually have guests and they would treat me, almost, like their own. It made me feel very welcomed, except when they would begin to speak to each other. That always throws me off course. I went from smiling, laughing and trying to make small talk to just staring at a point on the wall or just staring at the TV as they spoke in rapid-fire Greek. 0 – 100 real quick. But I got used to it. It was a challenge for me to enjoy myself here. There was this one time that a friend of mine pointed out that I was very cheerful and I was “emoting”. It was very interesting of her to say that – I had always thought I was emoting. Unknowingly, I had this solemn, somber, indifferent look on my face if I wasn’t particularly into conversations; probably an RBF but sadder. I was immensely insecure about being miles and miles away from my comfort zones. It was my defense mechanism. I didn’t want to be one of those small town people who forgot themselves once they moved to the big city, the big leagues. Focused on not losing myself and home, I refused to enjoy what Sydney had to offer. But that always resulted in my sitting in my room, taking long walks down memory lane and getting lost in a whirlwind of emotions. That’s not healthy. Coming back for my second semester here, I’ve resolved to enjoy myself. Sure, I’ve had to grow up and mature pretty quickly, and I’m still a bundle of nerves anxiety. But, I’ve begun to accept that I’m 17 and miles away from home. It can only be a good thing in the long run and it’s the start of something great. The weather will change but it doesn’t mean I can’t get the most out of it. I’ve got a mission here and that’s to make my parents proud, to make myself proud, and to grow. Like waves in the stormy ocean, responsibility and life broke the shores of my consciousness and washed me awake. Trying to surf the waves when I’ve only been practicing for 3 days is deadly. I will fall and get hurt but I’d hurt myself even more if I didn’t try. It wasn’t (and still isn’t) easy and I don’t expect it to be. I’ve always got support from my loving parents and my wonderful friends back home and here Down Under. To help myself enjoy myself Down Under, I chronicle my adventures on my blog here and through photos on my gallery. How long was I going to live under my parents’ wings? I’ve got my own. Let’s give them a test run.